Taking some of the technology seen in the Freeze pedal, the Electro Harmonix Superego is a synth effect pedal capable of producing some out of this world tones to really spice up your playing. Perfect for ambient and soundscape style tones, the Superego has three different modes that let the pedal be used in different ways to create a wide range of sounds. 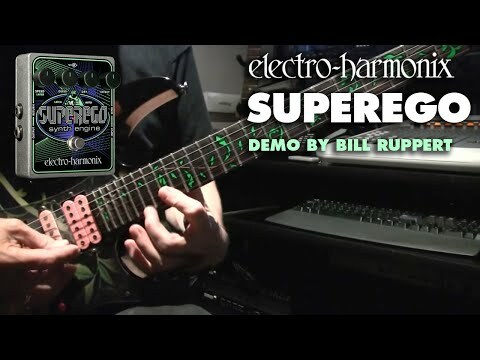 Just on its own, the Electro Harmonix Superego gives you an amazing range of tones to create and shape at your pleasure with the simple and fairly self explanatory controls. The latch mode offers infinite sustain of a note or chord and activates every time you hit the switch while the momentary mode just holds the played notes while you're pressing the pedal down. An auto mode is also on offer, which aims to do the work for you by tracking the chords you are playing. Controls for speed, glissando and level controls for both the dry and wet signal let you shape the synth style sound in many ways to create the tone you want. The built-in effects loop enables you to apply effects to the wet signal created by the pedal alone, whilst retaining an unblemished dry signal, offering some interesting and never ending possibilities. Add a delay pedal to create some wide ambient sounds or throw in some chorus to make the output more like a synth pad, there really is no limit to what the Electro Harmonix Superego can do thanks to this feature.